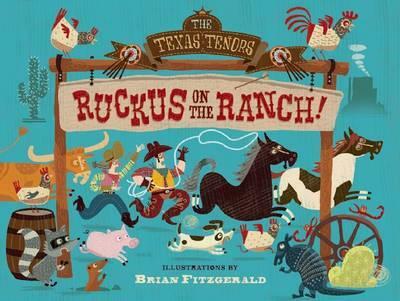 Kids' Book Review: Review: Ruckus on the Ranch! Review: Ruckus on the Ranch! Penned by the world-famous Texas Tenors, this rollicking picture book would be brilliant set to music, as its repetitive, holler-worthy text takes little ones on a wild ride through a classic Texan ranch. Indeed, the Tenors have written a song version, which can be heard on their website, along with book page peeks. When Wyatt the stallion chases after mare Ruby, they set off a chain reaction of rampant galloping, as a cowboy, cowgirl and assorted ranch animals, from pigs to chickens, join in the fun. 'Y'all get back in place!' is a constant refrain, as those pesky animals bolt across the pages, trailing the book's text and onomatopoeia behind them. Brian Fitzgerald's brilliant illustrations add vibrant colour, movement and texture that beautifully carries the story. His comical cowboys and cowgirls and adorable animals will utterly entrance kids (and adult PB aficionados). A fabulous book for toddlers and children in preschool and early learning settings, as the text would work well read aloud. Just practice first, to get a hold of the oftentimes-tongue-twisting Texan slang! Title: Ruckus on the Ranch!